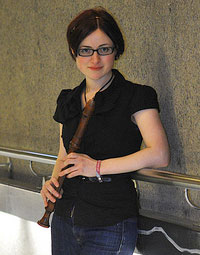 London-based Emily Askew is an extremely versatile musician playing recorders, shawm, vielle (medieval fiddle), bagpipes and fiddle. mily Askew is a versatile musician playing recorders, vielle (medieval fiddle), bagpipes, fiddle and piano. Her interests are wide and varied reaching from the deep roots of folk music through to Medieval, Baroque and contemporary repertoire. At the Guildhall School of Music and Drama, Emily studied with Ian Wilson, William Lyons, Robert Ehrlich and Pamela Thorby. She graduated with a first class honours BMUS and also received the Dove Memorial Prize for the highest BMUS mark in her year. She is now a principal study recorder teacher at Trinity Laban. Emily has been an established performer on the Folk scene for 14years. Over this time she has released three highly successful albums and has toured extensively with Askew Sisters. She is also a member of fiddle band Alma and last year released her debut album with The Emily Askew Band, which reviewed rave reviews in Folk and National press. A keen chamber musician, Emily also performs with a range of early music ensembles. These have included The Artisans, Joglaresa, Mediva and The Dufay Collective. She also enjoys collaborations between different art forms. Recent work includes Yonec, the Dufay Collective's Puppet project, A Long Walk Home with contemporary dancers choreographed by Darren Ellis and Walk the Way, the Artisans collaboration with poets Paulina Vauderbilt and Lucy Aykroyd. Emily is also interested in opera and theatre. She has performed as principal recorder at Glyndebourne and as a multi-instrumentalist in productions for Apollo West End, Shakespeare's Globe Theatre, the Sam Wanamaker Playhouse and the Hampstead Players. © Emily Askew. All rights reserved. Site build and maintenance by Dave Baker. Photographs by Otis Luxton & Ella Jones.